Amazingly enough, I was actually up early the day after the graduation ceremony, to go to Kyoto with some friends. There’s a flea market held in the grounds of Toji temple on the 21st of every month, which I’d assiduoudly failed to go to for several months running. Last Sunday I broke the habit and went. In between hunting for presents for people back home, I managed to pick up a new watch. 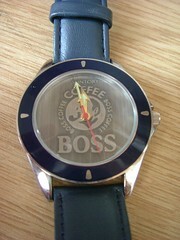 As if anyone ever doubted how much I love Boss coffee.